The Singapore National Eye Centre (SNEC) is the first and only specialist eye centre outside of Japan in Asia to offer a number of innovative yet extremely effective eye surgeries. 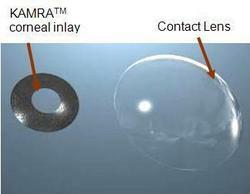 One such procedure is a corneal inlay treatment called KAMRA. Introduced just last year (2009) this procedure helps correct presbyopia, an age-related eye condition that affects more than one billion people worldwide. "Presbyopia is a natural aging condition of the eye that eventually affects everyone. Our eyes are like the camera's autofocus lenses. As you age, your eye muscles become weaker and your lenses lose their autofocus ability," explained Professor Donald Tan, Medical Director and Head of Corneal Service at the Singapore National Eye Centre. The condition begins its gradual progress when a person reaches the age of 45 and peaks at around 60 years of age. The impact on daily living can be quite disturbing, especially for those who are already long-sighted. The inability to see near and far can cause disorientation and in many cases, simple tasks like reading the time off a wrist watch becomes a difficulty. "Presbyopia prevents you from performing normal activities such as reading the newspapers or the SMS on your mobile phone. It can compromise a person's quality of life," said Prof Tan. While most resign themselves to bifocals and spectacles as they age, there is now a more permanent and hassle-free solution to presbyopia – a surgical procedure called KAMRA. This new procedure is very safe and very fast, taking only about 15 minutes. It is an approved operation, coming at the end of almost a decade of cutting-edge research. "This is the first and only really successful treatment for presbyopia. There is no longer any need to suffer in silence. What the surgeon will do is simply cut a flap or incision using a laser, then implant the KAMRA inlay in the cornea, center it and close the flap," explain Prof Tan. The tiny device, which is much small than a contact lens, is almost invisible to the naked eye, and needs to be implanted in only one eye. No stitching is required. Unlike other implants, this one can be removed and replaced when newer "upgraded" versions come along. What's more, the improvement to vision is almost immediate. For some patients, they will be able to tell the difference after only one day. The majority of patients notice the improvement within the week and visual quality will continue to improve with time. Currently, this procedure is only performed in a handful of countries. Apart from Singapore, only Japan in Asia offers this treatment. (KAMRA is still at clinical trial stage in the US) This day procedure costs about Singapore Dollars $4,000. The SNEC is also one of few places in the world to offer evolutionary methods of cornea transplant. Each year, the centre carries out about 250 cornea transplants, of which a full third comprises foreign patients. With a success rate of well over 90 percent, it is also fast becoming an international referral centre for complicated cases. "Several eye conditions cause clouding of the normally clear cornea, leading to blindness. In such cases, cornea transplant is the solution," said Prof Tan. Age-related corneal degeneration and corneal scars due to direct eye injuries are the top two reasons for transplantation. Other causes include inherited corneal diseases and congenital birth defects. Two transplant procedures are available at the moment to treat corneal damage. The first is termed Deep Anterior Lamellar Keratoplasty (DALK) – a new form of transplantation where only the damaged front layers of the cornea is exchanged, leaving the innermost layer intact. "DALK is technically more difficult, but results are much better because transplant rejection is almost zero. Usually, it is the inner layer of the cornea that is prone to rejection," explained Prof Tan. For this reason, DALK is often performed in cases where the patient's inner corneal layer is healthy. Success rate for DALK is over 95 percent, and long term graft survival is far superior to conventional treatments. At SNEC, 30 percent of all the transplants are DALK. The second type is cornea transplantation is DSAEK, or Descemets Stripping Endothelial Keratoplasty, where the inner, endothelial layer of the cornea needs to be transplanted. "DSAEK is for diseases of the inner layer, which is the main problem in ageing diseases. It is a relatively new procedure as it is also a keyhole, small incision surgery," explained Prof Tan. DSAEK requires complex instrumentation, and SNEC was the first to invent a special disposable donor inserter to coil the donor tissue through the small wound. "We are the official Asian trainers for DSAEK surgery and run several courses a year (for both DSAEK and DALK), with surgeons coming from all over Asia, Middle East, New Zealand and Australia to attend our training courses. We also regularly run training courses for these procedures at international meetings in the US, Europe, Middle East and other Asian countries, including Japan, Korea, India, Taiwan," said Prof Tan. At SNEC, DSAEK success rate is also in the region of 95 percent. "Outside of the US, we have performed more DSAEK surgeries than any single institution in Europe or Asia. The cost of performing a DSAEK here, too, is about half that of the US," said Prof Tan. SNEC manages an annual workload of a quarter million patient visits, 14,000 major eye surgeries and 13,000 laser procedures. SNEC is actively involved in clinical trials and research into the causes and treatment of major eye conditions such as myopia and glaucoma. Thousands of ophthalmologists from neighboring countries and beyond have participated in the Centre's teaching courses and international meetings organized annually. To advance ophthalmic science and service, and to increase opportunities for professional interactions and collaboration, SNEC has also fostered strategic links with leading eye institutions worldwide. Launched in 2003, SingaporeMedicine is a multi-agency government-industry partnership committed to strengthening Singapore's position as Asia's leading medical hub, and promoting Singapore as a world-class destination for advanced patient care. For more information on SingaporeMedicine, please visit "http://www.singaporemedicine.com"